So i haven't tried to connect my 640 to a PC for a while, mostly 'cause i had no reason to. So today when i wanted to transfer some music to it, i pluged it in, and what i get? I transfered some music and ringtones to my Lumia succesfuly months ago, and haven't tried since (back then it was on 8.1), now that i'm on the last build, well, it doesn't work. 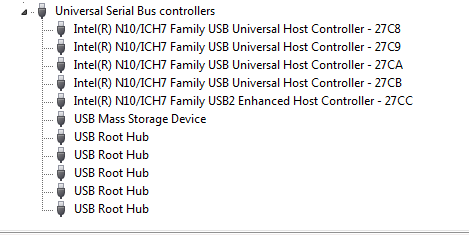 I tried installing and replacing drivers, deleted every single one from Device Manager so that PC could get them automaticlly, that too didn't help. I'm desperate for solution, not 'cause i need it to work that badly, but 'cause it started eating me alive. Anyone with an idea i haven't tried, i'd be more than glad to hear your voice. Checked all five of them. Other than this message i got another one saying that my device was disconnected, while it wasn't, and the phone itself was giving me that charging icon in the top right corner. And if i try to plug my mouse in the same port (to check if it's working again), well it all works like a charm. So ports are ok.
With phone plugged, go to pc device manager and uninstall all Nokia related devices (usb, com, ecc). And there's nothing under the portable devices. Maybe i should mention that my Lumia 535, which is still on the 8.1, connects to my PC with no issues or whatsoever. That's the reason i assumed it was the preview's fault. It is the fault of the insider preview. 2 builds ago i had no problems.. now the same problem as you. Let's hope MS will fix it. This is kinda one of those basic things one phone should be able to do. Cable is not an issue. Is that for real? Of course i did a hard reset, i do it every time. Then i suppose i'll have to wait and hope this will get fixed in future builds, 'cause i have to do a hard reset. I have only hard reset once, and it was on 10581 so I had this problem... I won't ever hard reset again unless it is absolutely necessary. Yes, it is for real. From the 10586 release notes: After we released Build 10581 to Windows Insiders in the Fast ring, we discovered a bug in the build that will cause the filesystem to become partially corrupted after doing a factory reset. For those of you who did a factory reset of your phone, you most likely did not notice this issue on Build 10581. Due to this bug however, upgrading to Build 10586 will cause your phone to go into a reboot loop after the upgrade completes – rebooting at the Windows or operator logo. To recover your phone, you can use the hardware key combination to reset your phone which will then put it at the OOBE experience on Build 10586. We highly recommend that you make sure you do a backup your phone *before* upgrading to Build 10586 due to this bug. Additionally, you can also recover your phone by using the Windows Device Recovery Tool to go back to Windows Phone 8.1 and then upgrade to Build 10586. But it appears that a hard reset after the 10586 upgrade only partially fixes the problem. You have to use the WDRT to fully recover. I might do it somewhere in near future, i don't need it desperately right now, so i'm gonna wait. But hey, thanks for the info. After last build I had to revert to 8.1 to fix connection to PC issue. After updating to .29 the issue has returned. My 930 is not recognised by PC. Looks like i won't be upgrading to 10586.29. Too many battery drain issue reports. I'm gonna stick to the build i have for now and wait for the next one. Faulty screen, ghost clicking and charging issues Surface 3. Can I get some help?